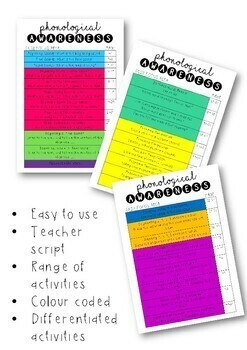 This resource was designed to save teachers time, not having to think of their own words on the spot, when doing phonological awareness with their students. It focuses on many different phonological awareness areas (Please see Contents page for more information. 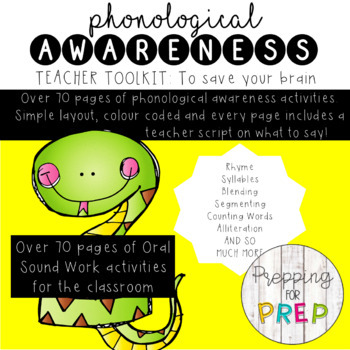 It includes 73 pages of activities for you to use with your students to strengthen for phonological and phonemic awareness skills- as these go hand in hand. Simply print off the cover page and all the pages included in the bundle. Staple them together, bind them, put them in a plastic pocket folder- you do whatever works best for your classroom and you! The contents pages and the strip at the bottom of every page in the pack is colour coded to make it easier for you to find what page/skill you are focusing on to save you time. Each page is labelled with the page number- in case you accidentally muddle up the order etc. The page numbers and the skills are all clearly labelled on the next 3 pages for your convenience. How to use in the classroom: You can use these at any time during the day. Some ideas are: During literacy groups, in a circle on the floor with your whole class, during carpet time with your whole class. 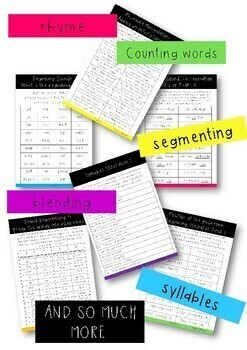 They can be used for small group or one on one during intervention work. They are quick and easy and can be used between transitions from one activity to the next or even one on one out the door before recess or lunch! The options are endless! Each page provides you with a teacher script on what to say to save you time thinking. It is designed to save educators time thinking of words, as this is quite difficult when you are in a room with a group or whole class of students. Follow along on my Instagram and my TPT, to see when I upload more resources and activities that you might find useful for your students. Which word has 1 syllable? Which word has 2 syllables? Which word has 3 syllables? Syllable manipulation- deleting a syllable. Which word rhymes? This or that? 2 of these words rhyme and 1 does not. Which word does not rhyme? Can you tell me a word that rhymes?